Stuck between a rock and a hard drive. Intel's 800p delivers great performance, with some odd handicaps, and a price per gigabyte that's not a good value. Last year, Intel brought out the first of what will eventually be many products based on the jointly developed (with Micron) 3D XPoint Technology. 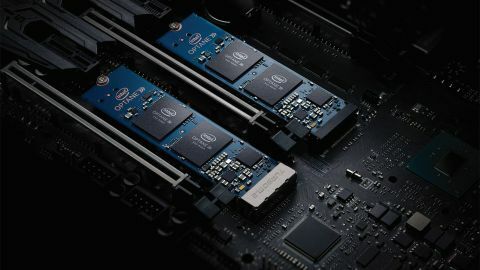 For enterprise solutions, the extreme durability and performance are impressive, and in the future Intel hopes to bring 3D XPoint into server memory products—as in, actual DIMMs that fit into the server's traditional DRAM slots. Outside of the enterprise market, however, 3D XPoint has so far been a tough sell. I came away extremely impressed by the performance of Intel's Optane 900p, for example, but the cost and capacity are such that I can't in good conscience recommend such a drive for most users—particularly for gamers, what with games like FFXV sucking down nearly 150GB in one gigantic gulp. If you're running programs that need lots of fast storage, great, and in ten years this is probably what 'average' storage solutions will look like, but right now it's bleeding edge tech. Before the 900p was Optane Memory, a storage caching solution that works, but ends up with the same drawbacks of all caching solutions: it doesn't really help the first time you do something, and if your commonly used data is too big for the cache, performance can suffer. Intel is adding to the above consumer Optane solutions with today's 800p launch, which looks a lot like the Optane Memory parts but functions more like the 900p. The 800p comes in two capacities, 58GB or 118GB, both in M.2 format. Where things take a turn for the strange is the PCIe x2 interface—it's almost like Intel looked at the performance and thought it was too close to the 900p. Except the price and capacity is such that it should be similar in performance. From my perspective, the 118GB 800p is a bit less than half the storage of the 280GB 900p, and it costs slightly more than half as much, which means it's not a particularly good value. The 58GB model takes things a step further, since it's a bit less than half the capacity of the 118GB model but costs a bit more than half as much. Ugh. Wait, only 58GB and 118GB—what's up with those capacities, especially the 58GB model? With Windows 10, I shudder to even think about trying to install the OS and a few primary apps and keep things running smoothly without having to constantly monitor available drive space. Even 118GB is dangerously small for a lot of people. Now toss in the pricing, and the 800p ends up in this weird market niche that I'm not sure who would buy it. You can get about four times the capacity (slightly more) for roughly the same price with Intel's 760p SSDs. The people that need fast storage also tend to need more fast storage, and 58GB or 118GB just isn't going to cut it. If you don't need ultra-fast storage, which is most of us, then just about any modern SSD will suffice. Intel makes a point about how the 800p delivers great performance where most client workloads run—at queue depths of 1-2, not 16 or 32—and it's absolutely correct that focusing on performance for low queue depths is important. The thing is, most workloads occur at low queue depths because the workload isn't storage limited in the first place. One of the most common tasks you might perform that hits storage hard is to copy files from a drive onto the same drive, which requires sustained read and write throughput. As we'll see in the benchmarks, the 800p does great in this test, but how often are you going to be making copies of large amounts of data, especially on a 58GB drive? For the performance testing, along with the 800p models, I've highlighted the Samsung 860 Evo 500GB—a good SATA SSD. Another drive you'll want to pay attention to is Adata's SX7000NP, which holds the distinction of being the cheapest 512GB-class NVMe SSD. Depending on the workload, the 800p can range from dead last (pure sequential read/write performance) to top of the charts. In general, it feels plenty fast, and if you can live with the limited capacity you'll likely never notice the slight reduction in maximum throughput. The problem is that, as I've pointed out before, pure SSD performance isn't the holy grail—storage performance in general is only a problem when it's far too slow. Hard drives definitely fall into that classification for me, now that I've been using SSDs as my boot/OS drive for several years, but going from even one of the slower SSDs to the fastest SSD isn't all that noticeable. Price per GB ends up being a far bigger factor than raw performance, particularly if you're thinking about storing more than one or two games on an SSD. My SSD benchmark suite consists of a mix of theoretical and real-world metrics. Other tests are also run both to condition the drive and to ensure there are no oddities, but for the charts I focus on CrystalDiskMark, IOMeter (mixed read/write performance), file copying, and PCMark 8 Storage. I take the results (in MB/s) from ten of the tests and give each equal weighting (ie, geometric mean) to come up with the aggregate score. While it's impossible for a single number to tell you everything you need to know about an SSD, it provides a good high-level view of what to expect. Swipe left/right to view additional tests. In terms of performance, Intel's 800p drives deliver the goods. They're nearly as fast as the best NAND-based SSDs, and not all that far behind even the 900p. They even beat Samsung's 960 Evo, which means they're also faster than nearly all other SSDs. Sequential performance is one of the weak points, most likely thanks to the decision to keep the interface at x2 instead of x4. Low queue depth random IO on the other hand is excellent, even beating the 900p for read speeds. Also worth noting is that there's very little practical difference in performance between the 58GB and 118GB models—3D XPoint appears to hit full performance even with just a few chips on the package. Subjectively, the only time I notice a difference between most of the drives is if I'm specifically running storage benchmarks ("Look, bigger numbers! "), or if I'm copying lots of files to or from the SSDs—or perhaps verifying files for a Steam game. I can totally get behind the idea of screamingly fast 3D XPoint storage for servers running dozens of VMs or a large transactional database, or for HPC stuff with large data sets that won't fit into RAM. For consumer workloads, it's more difficult to find a good mission statement, and the capacity and price are a major hangup. Intel's high performance NVMe SSDs have traditionally occupied the lower tiers of our value-oriented charts. The SSD 750 line was the fastest drive around several years back, with a price to match, and the new 900p crossed back over the $1 per GB line. The 800p ends up being a bit slower, with an even higher price per GB—over $2 per GB on the 58GB drive—and end up well below the next closest NVMe drives. I get the idea that most users don't really need massive SSDs, but by the same token most users won't really see a major difference between varying levels of SSD either. If you look at the PCMark 8 Storage score—not the raw bandwidth value—you'll see that the gap between the fastest and slowest SSD I've included is just over two percent. We can argue about whether or not that properly represents the difference you'd see between the drives (the bandwidth score shows a 285 percent gap), but if you're timing how long it takes to launch a game, or boot Windows, we've clearly hit the point of diminishing returns. I can see businesses maybe taking a stab at the 118GB 800p, because that's certainly enough storage capacity for a typical office computer, but the $200 price tag is going to be harder to justify. Yes, it's faster than some other drives, but for about the same price you can get the 512GB Intel 760p, or the 500GB Samsung 960 Evo. I would much rather sacrifice a bit of performance for quadruple the capacity, even if half of it doesn't get used. The 58GB model on the other hand is right out—Windows 10 on it's own loves to use about that much between the main OS and the rollback files for the previous build. That's a headache waiting to happen. Something else that's a bit odd is that Intel has intentionally bifurcated Optane into arguably too many paths. Enterprise and consumer is a sensible market split. High-end consumer SSD and Optane Memory caching technology is a bit more specious. High-end 900p and still-high-end 800p only with lower capacities and a PCIe x2 limitation? Yeah, sorry, but no. I wish Intel validated the caching software for use with the larger 800p drives (and even the 900p), because with a 118GB fast SSD cache people could potentially pair it with a large 8TB HDD and then let the caching algorithms worry about what data is actually being used on a regular basis. Start playing a lot of PUBG, and it ends up in the cache. Likewise for Vermintide 2 and maybe one or two other games—plus the core Windows files, your browser code, and a few other tidbits. Then if you stop playing other games and binge on FFXV for a few weeks, your PC could automatically adapt to your usage patterns. It might not be perfect, but it's at least something. Unfortunately, Optane Memory and Optane 800p are mutually exclusive technologies (even though they're basically the same core hardware). If you feel the need for speed, the Optane 900p is already there—ironically still with a lower price per GB. If you're after more bang for the buck, Intel has you covered with the 760p line as well, or you can grab any number of other non-Intel drives. I still think 3D XPoint is going to have a big impact on future storage trends, but right now it's not price competitive. Performance is great, but capacity and price still matter, and that's where the 800p comes up short.